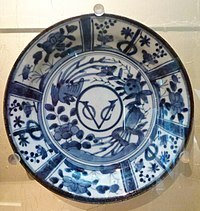 A Japanese Arita porcelain plate with monogram of the Dutch East India Company (VOC). In terms of creating a corporate identity, the VOC was a pioneering business model in the early modern period. The Company had its own logo, which it placed on all kinds of objects — official documents bore the VOC monogram seal, its packaged crates of goods were branded with the same, its property — from cannons to pewter to porcelain. The Company's monogram logo was possibly in fact the first globally recognized corporate logo. Replica of an East Indiaman of the Dutch East India Company/United East India Company (VOC). Corporate identity is a primary goal of the corporate communications, for the purpose to maintain and build the identity to accord with and facilitate the corporate business objectives. The corporate identity is typically visualized by way of branding and the use of trademarks,but it can also include things like product design, advertising, public relations etc.. . In general, this amounts to a corporate title, logo (logotype and/or logogram) and supporting devices commonly assembled within a set of corporate guidelines. These guidelines govern how the identity is applied and usually include approved colour palettes, typefaces, page layouts, fonts, and others. Corporate identity is the set of multi-sensory elements that marketers employ to communicate a visual statement about the brand to consumers (Businessdictionary.com, n.d.). These multi-sensory elements include but are not limited to company name, logo, slogan, buildings, décor, uniforms, company colours and in some cases, even the physical appearance of customer facing employees (Businessdictionary.com, n.d.). Corporate Identity is either weak or strong; to understand this concept, it is beneficial to consider exactly what constitutes a strong corporate identity. Consonance, in the context of marketing, is a unified message offered to consumers from all fronts of the organisation (Laurie & Mortimer, 2011)[not in citation given]. In the context of corporate identity, consonance is the alignment of all touch points (Bailey, 2015). For example, Apple has strong brand consonance because at every point at which the consumer interacts with the brand, a consistent message is conveyed. This is seen in Apple TV advertisements, the Apple Store design, the physical presentation of customer facing Apple employees and the actual products, such as the iPhone, iPad and MacBook laptops. Every Apple touch point is communicating a unified message: From the advertising of the brand to the product packaging, the message sent to consumers is 'we are simple, sophisticated, fun and user friendly' (Marketing Minds, 2014). Brand consonance solidifies corporate identity and encourages brand acceptance, on the grounds that when a consumer is exposed to a consistent message multiple times across the entirety of a brand, the message is easier to trust and the existence of the brand is easier to accept (Hoyer, MacInnis & Pieters, 2012). Strong brand consonance is imperative to achieving strong corporate identity. Strong consonance, and in turn, strong corporate identity can be achieved through the implementation and integration of integrated marketing communications (IMC). IMC is a collective of concepts and communications processes that seek to establish clarity and consistency in the positioning of a brand in the mind of consumers (Ang, 2014). As espoused by Holm (cited in Laurie & Mortimer, 2011), at its ultimate stage, IMC is implemented at a corporate level and consolidates all aspects of the organisation; this initiates brand consonance which in turn inspires strong corporate identity. To appreciate this idea with heavier mental weight it is important to regard the different levels of IMC integration. The communication-based model, advanced by Duncan and Moriarty (as cited in Laurie & Mortimer, 2011) contends that there are three levels of IMC integration; Duncan and Moriarty affirm that the lowest level of IMC integration is level one where IMC decisions are made by marketing communication level message sources. These sources include personal sales, advertising, sales promotion, direct marketing, public relations, packaging and events departments. The stake holders concerned at this stage are consumers, local communities, media and interest groups (Duncan and Moriarty, 1998 as cited in Laurie & Mortimer, 2011). At the second stage of IMC integration Duncan and Moriarty (as cited in Laurie & Mortimer, 2011) establish that level one integration departments still have decision making power but are now guided by marketing level message sources. At stage two integration the message sources are those departments in which product mix, price mix, marketing communication and distribution mix are settled; appropriately, stakeholders at this stage of integration are distributors, suppliers and competition (Duncan and Moriarty, 1998 as cited in Laurie & Mortimer, 2011). It should also be noted that it is at this stage of integration that consumers interact with the organisation (Duncan and Moriarty, 1998 as cited in Laurie & Mortimer, 2011). Moving forward, the last stage Duncan and Moriarty's Communication Based Model (as cited in Laurie and Mortimer, 2011) is stage three where message sources are at the corporate level of the organisation; these message sources include administration, manufacturing operations, marketing, finance, human resources and legal departments. The stake holders at this level of IMC integration are employees, investors, financial community, government and regulators (Duncan and Moriarty, 1998 as cited in Laurie & Mortimer, 2011). At the final stages of IMC integration, IMC decisions are made not only by corporate level departments but also by departments classed in stages one and two. It is the inclusion of all organisational departments by which a horizontal, non linear method of communication with consumers is achieved. By unifying all fronts of the marketing firm, communications are synchronised to achieve consistency, consonance and ultimately strong corporate identity. Corporate identity is the way corporate actors (actors who perceive themselves as acting on behalf of the company) make sense of their company in ongoing social interaction with other actors in a specific context. It includes shared perceptions of reality, ways-to-do-things, etc., and interlocked behaviour. The following four key brand requirements are critical for a successful corporate identity strategy. Differentiation. In today's highly competitive market, brands need to have a clear differentiation or reason for being. What they represent needs to stand apart from others in order to be noticed, make an impression, and to ultimately be preferred. Relevance. Brands need to connect to what people care about out in the world. To build demand, they need to understand and fulfil the needs and aspirations of their intended audiences. Coherence. To assure credibility with their audiences, brands must be coherent in what they say and do. All the messages, all the marketing communications, all the brand experiences, and all of the product delivery need to hang together and add up to something meaningful. Esteem. A brand that is differentiated, relevant and coherent is one that is valued by both its internal and external audiences. Esteem is the reputation a brand has earned by executing clearly on both its promised and delivered experience. Corporate visual identity plays a significant role in the way an organization presents itself to both internal and external stakeholders. In general terms, a corporate visual identity expresses the values and ambitions of an organization, its business, and its characteristics. Four functions of corporate visual identity can be distinguished. Three of these are aimed at external stakeholders. First, a corporate visual identity provides an organisation with visibility and "recognizability". For virtually all profit and non-profit organisations, it is of vital importance that people know that the organization exists and remember its name and core business at the right time. Second, a corporate visual identity symbolizes an organization for external stakeholders, and, hence, contributes to its image and reputation (Schultz, Hatch and Larsen, 2000). Van den Bosch, De Jong and Elving (2005) explored possible relationships between corporate visual identity and reputation, and concluded that corporate visual identity plays a supportive role in corporate reputations. Third, a corporate visual identity expresses the structure of an organization to its external stakeholders, visualising its coherence as well as the relationships between divisions or units. Olins (1989) is well known for his "corporate identity structure", which consists of three concepts: monolithic brands for companies which have a single brand, identity in which different brands are developed for parts of the organization or for different product lines, and an endorsed identity with different brands which are (visually) connected to each other. Although these concepts introduced by Olins are often presented as the corporate identity structure, they merely provide an indication of the visual presentation of (parts of) the organization. It is therefore better to describe it as a "corporate visual identity structure". A fourth, internal function of corporate visual identity relates to employees' identification with the organization as a whole and/or the specific departments they work for (depending on the corporate visual strategy in this respect). Identification appears to be crucial for employees, and corporate visual identity probably plays a symbolic role in creating such identification. Corporate visual identity management involves the planned maintenance, assessment and development of a corporate visual identity as well as associated tools and support, anticipating developments both inside and outside the organization, and engaging employees in applying it, with the objective of contributing to employees' identification with and appreciation of the organization as well as recognition and appreciation among external stakeholders. Special attention is paid to corporate identity in times of organizational change. Once a new corporate identity is implemented, attention to corporate identity related issues generally tends to decrease. However, corporate identity needs to be managed on a structural basis, to be internalized by the employees and to harmonize with future organizational developments. Efforts to manage the corporate visual identity will result in more consistency and the corporate visual identity management mix should include structural, cultural and strategic aspects. Guidelines, procedures and tools can be summarized as the structural aspects of managing the corporate visual identity. However, as important as the structural aspects may be, they must be complemented by two other types of aspects. Among the cultural aspects of corporate visual identity management, socialization – i.e., formal and informal learning processes – turned out to influence the consistency of a corporate visual identity. Managers are important as a role model and they can clearly set an example. This implies that they need to be aware of the impact of their behaviour, which has an effect on how employees behave. If managers pay attention to the way they convey the identity of their organization, including the use of a corporate visual identity, this will have a positive effect on the attention employees give to the corporate visual identity. Further, it seems to be important that the organization communicates the strategic aspects of the corporate visual identity. Employees need to have knowledge of the corporate visual identity of their organization – not only the general reasons for using the corporate visual identity, such as its role in enhancing the visibility and recognizability of the organization, but also aspects of the story behind the corporate visual identity. The story should explain why the design fits the organization and what the design – in all of its elements – is intended to express. Blue for IBM, nicknamed "Big Blue"
Brown for UPS, "What can Brown do for you"
Nearly 7,000 years ago, Transylvanian potters inscribed their personal marks on the earthenware they created. If one potter made better pots than another, naturally, his mark held more value than his competitors'. Religions created some of the most recognized identity marks: the Christian cross, the Judaic Star of David, and the Islamic crescent moon. In addition, Kings and nobles in medieval times had clothing, armour, flags, shields, tableware, entryways, and manuscript bindings that all bore coats of arms and royal seals. The symbols depicted a lord's lineage, aspirations, familial virtues, as well as memoirs to cavalry, infantry, and mercenaries of who they were fighting for on the battlefields. A trademark became a symbol of individuals' professional qualifications to perform a particular skill by the 15th century. For example, the Rod of Asclepius on a physician's sign signified that the doctor was a well-trained practitioner of the medical arts. Simple graphics such as the caduceus carried so much socio-economic and political weight by the 16th century, that government offices were established throughout Europe to register and protect the growing collection of trademarks used by numerous craft guilds. The concept of visually trademarking one's business spread widely during the Industrial Revolution. The shift of business in favour of non-agricultural enterprise caused business, and corporate consciousness, to boom. Logo use became a mainstream part of identification, and over time, it held more power than being a simple identifier. Some logos held more value than others, and served more as assets than symbols. Logos are now the visual identifiers of corporations. They became components of corporate identities by communicating brands and unifying messages. The evolution of symbols went from a way for a king to seal a letter, to how businesses establish their credibility and sell everything from financial services to hamburgers. Therefore, although the specific terms "corporate image" and "brand identity" didn't enter business or design vocabulary until the 1940s, within twenty years they became key elements to business success. As technology and mass media have continued to develop at exponential rates, the role of the media in business increases as well. The media has a large effect on the formation of corporate identity by reinforcing a company's image and reputation. Global television networks and the rise of business news have caused the public representation of organizations to critically influence the construction and deconstruction of certain organizational identities more than ever before. Many companies pro-actively choose to create media attention and use it as a tool for identity construction and strengthening, and also to reinvent their images under the pressure of new technology. The media also has the power to produce and diffuse meanings a corporation holds, therefore giving stakeholders a negotiation of the organizational identity. ^ Zuber, Charles. "VOC: The logo that lasted". Designonline.org.au. Retrieved 18 March 2018. ^ Ang, L. (2014). Principles of Integrated Marketing Communications. New York City, NY: Cambridge University Press. ^ Belch, G. E., & Belch, M. A. (2012). Advertising and promotion: An integrated marketing communications perspective (9th ed.). New York, NY: McGraw-Hill Irwin. ^ Hoyer, W.D., MacInnis, D.J., & Pieters, R. (2012). Consumer behavior (6th ed.). Mason, OH: Cenage Learning. ^ Laudon, K.C., & Laudon, J.P. (2013). Essentials of management information systems (10th ed.). Harlow, Essex: Pearson Education Limited. ^ Laurie, S., & Mortimer, K. (2011). 'IMC is dead. Long live IMC': Academics' versus practitioners' views. Journal of Marketing Management, 27(13-14),1464-1478. Balmer, J.M.T., & Gray, E.R., (2000). Corporate identity and corporate communications: creating a competitive advantage. Industrial and Commercial Training, 32 (7), pp. 256–262. Balmer, John M. T. & Greyser, Stephen A. eds. (2003), Revealing the Corporation: Perspectives on identity, image, reputation, corporate branding, and corporate-level marketing, London, Routledge, ISBN 0-415-28421-X. Birkigt, K., & Stadler, M.M., (1986). Corporate identity. Grundlagen, Funktionen, Fallbeispiele. [Corporate identity. Foundation, functions, case descriptions]. Landsberg am Lech: Verlag Moderne Industrie. Bromley, D.B., (2001). Relationships between personal and corporate reputation, European Journal of Marketing, 35 (3/4), pp. 316–334. Brown, Jared & A. Miller, (1998). What Logos Do and How They Do It. pp. 6-7. Dowling, G.R., (1993). Developing your company image into a corporate asset. Long Range Planning, 26 (2), pp. 101–109. Du Gay, P., (2000). Markets and meanings: re-imagining organizational life. In: M. Schultz, Dutton, J.E., Dukerich, J.M., & Harquail, C.V., (1994). Organizational images and member identification. Administrative Science Quarterly, 39 (2), pp. 239–263. M.J. Hatch, & M.H. Larsen, (Eds.). The expressive organisation: linking identity, reputation and the corporate brand (pp. 66–74). Oxford: Oxford University Press. Kiriakidou, O, & Millward, L.J., (2000). Corporate identity: external reality or internal fit?, Corporate Communications: An International Journal, 5 (1), pp. 49–58. Olins, W., (1989). Corporate identity: making business strategy visible through design. London: Thames & Hudson. Paksoy, HB (2001). IDENTITIES: How Governed, Who Pays? Schultz, M., Hatch, M.J., & Larsen, M., (2000). The expressive organisation: linking identity, reputation and the corporate brand. Oxford: Oxford University Press. Stuart, H, (1999). Towards a definitive model of the corporate identity management process, Corporate Communications: An International Journal, 4 (4), pp. 200–207. Van den Bosch, A.L.M., (2005). Corporate Visual Identity Management: current practices, impact and assessment. Doctoral dissertation, University of Twente, Enschede, The Netherlands. Van den Bosch, A.L.M., De Jong, M.D.T., & Elving, W.J.L., (2005). How corporate visual identity supports reputation. Corporate Communications: An International Journal, 10 (2), pp. 108–116. Van Riel, C.B.M., (1995). Principles of corporate communication. London: Prentice Hall.